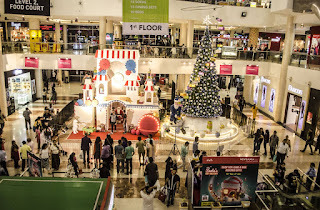 Mumbai, December 23, 2016: Viviana Mall, a leading retail destination mall in Mumbai Metropolitan Region has not only invited Santa Claus to the mall but also built a grand Santa’s Gift Factory inside Viviana Mall for celebrating Christmas at a grandeur scale. The mall has invited all its ardent customers to visit the factory. Viviana’a Santa’s Gift Factory has now become a major centre of attraction in town. With the Santa’s Gift Factory, any customer shopping at the mall will get a chance to win multiple gifts which also includes a bumper price of free shopping for an entire year. Special contests are already generated interests across social media platforms. Viviana Mall has also arranged Candle Décor Workshop, Wonderchef Cookery, Carol Singing and has also invited Jugglers, Unicyclists, etc. to enhance Christmas Celebrations. Commenting on Santa’s Gift Factory and Christmas celebrations, Ms. Rima Pradhan, Sr. Vice President, Marketing at Viviana Mall said, “We have always tried to make all festivals more interesting for our customers. As a mall, we believe in create a long lasting experience for our leisure conscious customers. All our efforts are channelized towards creating an idea that can make each and every visit of our customer special. Creating Santa’s Gift Factory inside the mall was also one such idea which we implemented to create an aura of Christmas inside the mall. The entire décor and activities has been planned keeping in view the celebrations everyday motto of our mall. The mall’s entire décor is covered in the Christmas mode with the mall decked up with Christmas tree, Christmas ornaments, Christmas wreaths and garlands, special LED lights to create a snowfall effect, etc. Viviana Mall, a part of Sheth Corp and well known as a ‘Destination Mall’ was built with an objective of giving an experience to its audience. Viviana covers over 250 leading brands in its prime retail and leisure space. The mall is India’s first and only visually impaired friendly mall and has also launched “XRCVC-Viviana Extension” a resource centre for visually impaired. With an area encompassing one mn sq.ft, the mall boasts of a unique tenant mix – Cinepolis, a megaplex with 14 screens, 19 anchor tenants for the first time in the country and brands like Shoppers Stop, Marks & Spencer, Charles & Keith, ZARA, Forever 21, Tommy Hilfiger, Lifestyle, Hamleys, Starbucks, Copper Chimney, Pizza Express, British Brewing Company, Irish House and many others making it the most happening destination in Thane. The defining feature of the mall is Cinepolis - one of the largest megaplexes in the country with a facility to showcase over 70 shows on a single day with a seating capacity of 2,400 people. It also facilitates 2400 number of cars and 800 two wheeler parking slot which considered to be one of the highest in the industry. Additionally, the large food court and the dining area are spread over 40, 000 sq ft and can seat upto 1, 300 people. The Mall opened its gate to endless discoveries in the year 2015 and since then it has garnered international and national accolades various categories.